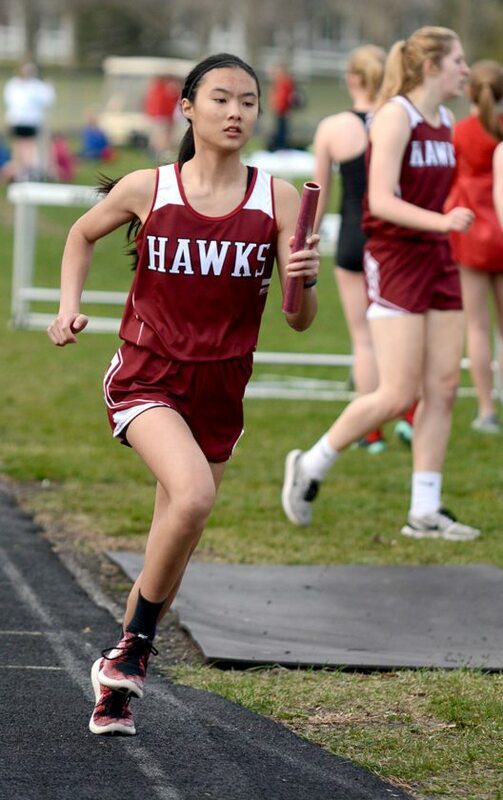 JEWELL — Practice, practice and more practice, it seems that’s all the South Hamilton girls’ track and field team has had to look forward to this spring. 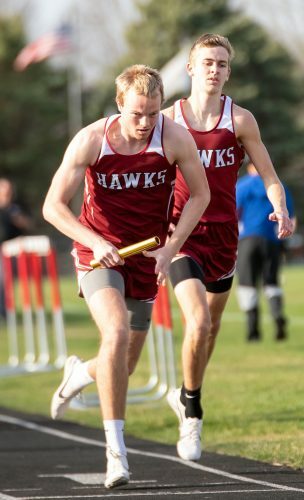 But, finally, the Hawks were able to put on the uniforms and see if those extra training sessions would pay dividends in a meet Tuesday evening at the Mike Penning Athletic Complex. 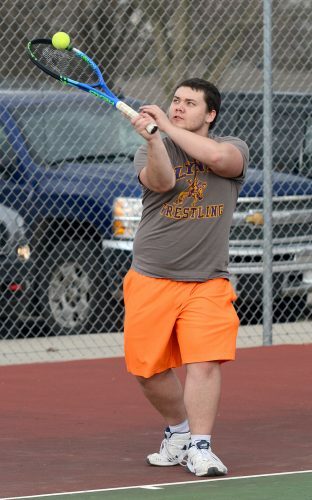 South Hamilton won five events — highlighted by a double in the throws courtesy of junior Lily Skartvedt — and picked up four second-place finishes at its own George Abell Hawkette Relays. The Hawks tallied 521⁄2 points to finish third in the five-team field. Roland-Story (88 points) secured the team title with room to spare over runner-up Collins-Maxwell (62). Clarion-Goldfield-Dows (511⁄2) and Colo-NESCO (22) rounded out the field. 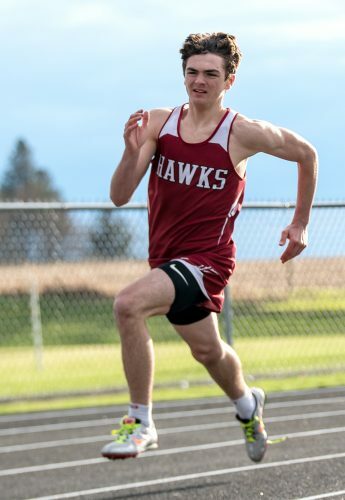 It was just the second meet of the season for South Hamilton and the first where the athletes weren’t forced to huddle for warmth when they weren’t competing. Skartvedt certainly got the Hawks off to a quick start, as she easily captured gold in the shot put and discus. Her top toss in the shot of 35 feet, 9 inches was a personal best and more than a foot clear of the field. She hit 100 feet on the nose to win the discus by more than six feet. Freshman Abby Ervin did her part on the track with a win in the 400-meter dash (1:08.10) and runner-up performance in the open 800 (2:52.80). 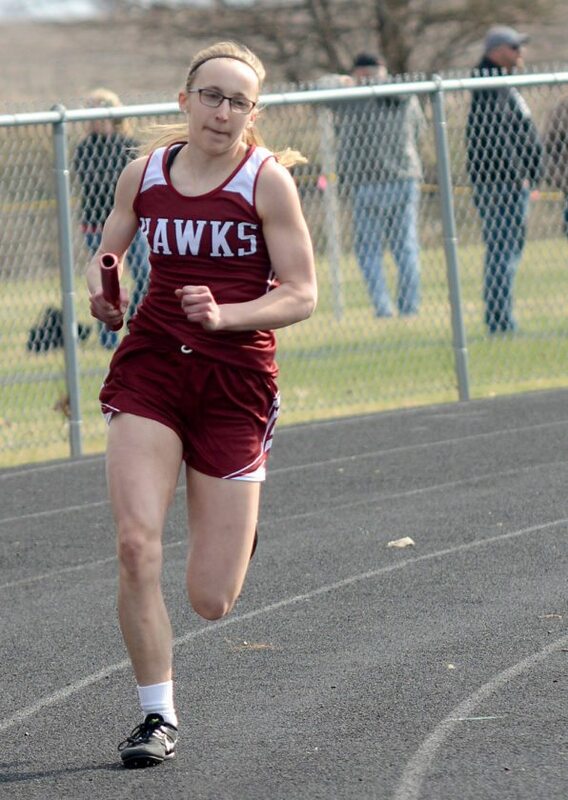 She also ran the anchor 400 leg of the Hawks’ silver medal sprint medley relay (2:05.20). 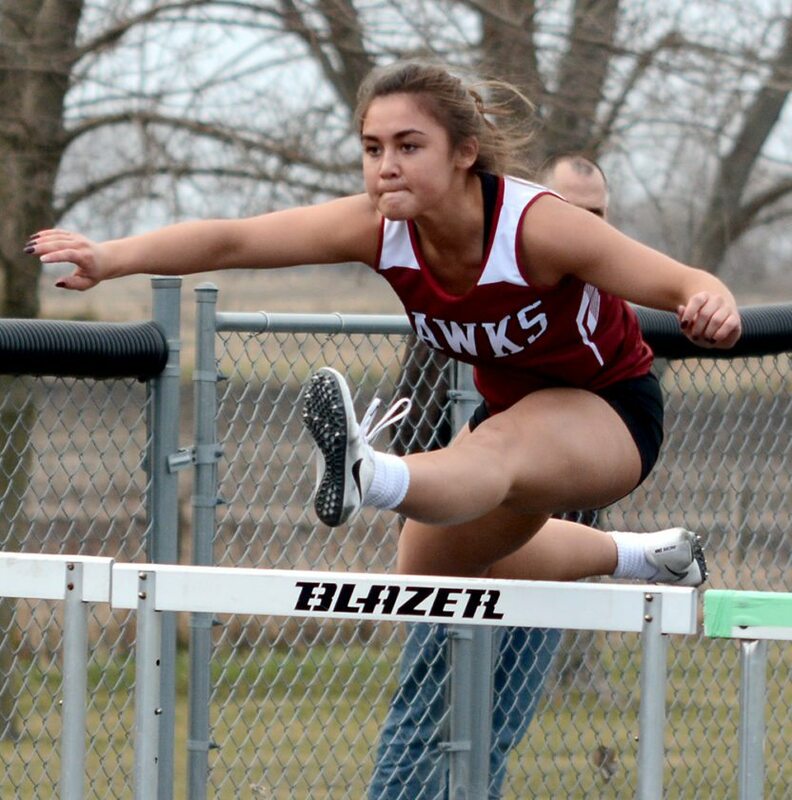 Hailey Cavan, a sophomore and returning state qualifier, was the top hurdler in the field. She claimed the 100 hurdles gold in 16.20 and ran the anchor leg of the Hawks’ victorious shuttle hurdle relay (1:11.90). Emily Greenfield, Bridgit Schlafke and Rylee Woodall ran the opening three legs. Greenfield and Anna Moss ran the middle two legs of the sprint medley. The duo and Skartvedt completed the 4×100. The Hawks’ 4×400 (4:57.20) — Natalie Johnson, Yolanda Licea, Sydney Friest and Breanne Diersen — was second as well. 1. Roland-Story 88; 2. Collins-Maxwell 62; 3. South Hamilton 521⁄2; 4. Clarion-Goldfield-Dows 511⁄2; 5. Colo-NESCO 22. Discus — 1. 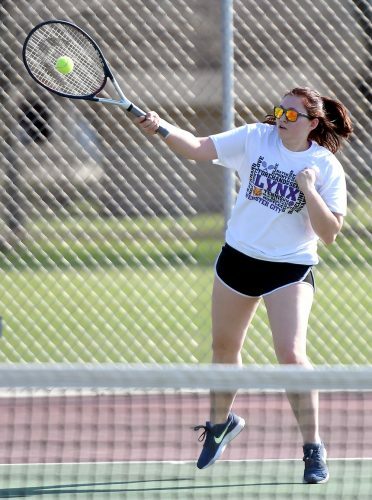 Lily Skartvedt 100-0; 13. Brenna Barquist 61-7. Shot Put — 1. Skartvedt 35-9; 10. Barquist 26-2. High Jump — T4. Sydney Friest 4-6; 7. Emma Heeren 4-2. 100 Meters — 6. Emma Lewis 14.10. 200 Meters — 7. Bridgit Schlafke 31.26. 400 Meters — 1. Abby Ervin 1:08.10; 12. Maddison Freeman 1:24.13. 800 Meters — 2. Ervin 2:52.80; 10. Katie Ralston 4:33.30. 100 Hurdles — 1. Hailey Cavan 16.20; 8. Schlafke 19.00. 1,500 Meters — 5. Marissa Jensen 6:20.00. 400 Hurdles — 6. Heeren 1:21.30. 4×100 Relay — 2. South Hamilton 55.70 (Cavan, Emily Greenfield, Skartvedt, Anna Moss). 4×200 Relay — 5. South Hamilton 2:06.60 (Bailey Martin, Lewis, Barquist, Heeren). 4×400 Relay — 2. South Hamilton 4:57.20 (Natalie Johnson, Yolanda Licea, Friest, Breanne Diersen). 4×800 Relay — 4. South Hamilton 12:36.00 (Johnson, Diersen, Jensen, Freeman). Shuttle Hurdle Relay — 1. South Hamilton 1:11.90 (Greenfield, Schlafke, Rylee Woodall, Cavan). Sprint Medley Relay — 2. South Hamilton 2:05.20 (Cavan, Greenfield, Moss, Ervin).